Hello and welcome to the fourth day of the Papertrey Ink March countdown and the first Design Team group post! Today's group post is all about showcasing the new Embellish Elegance stamp set and coordinating dies. I'm so happy to be working with Embellished Elegance! It's a beautiful set that's easy to work with and produces wonderful results. Take it simple or go all out. With a set like this, the sky is the limit. First up, the simple take. I simply stamped the sentiment (in spring rain and true black) and embellished it with a single vine element (my favorite from the set). Added a touch of color to the vine using the tiny floral images in these colors... spring rain, melon berry and sweet blush. 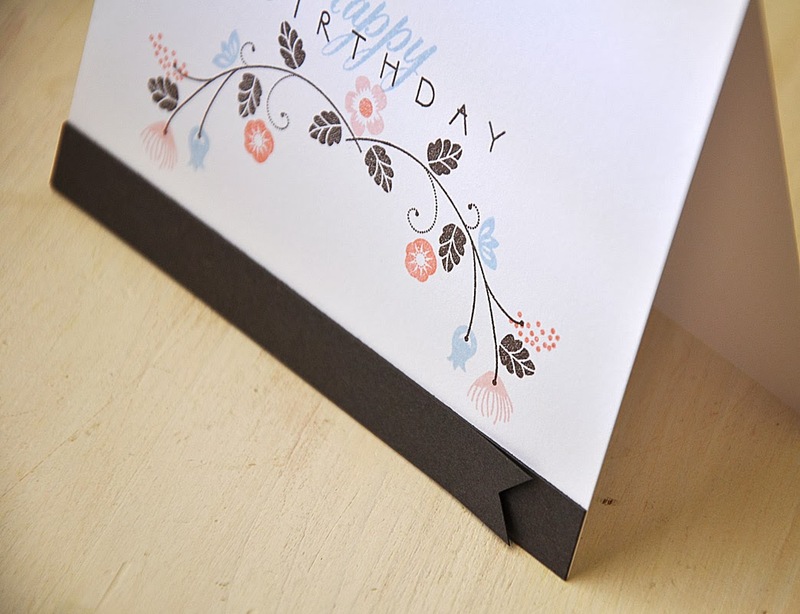 To the bottom edge of the card front, I layered a couple strips of smokey shadow cardstock. I carefully trimming a notch and attached the top strip with touch of dimensional adhesives, creating a bit of lift to the notched end. Next, my elaborate take. I chose to work with the same vine element to create a hand stamped pattern. Did you notice how I did not cover the entire front of the card base with the pattern? Yep, that was done on purpose. Kind of unexpected and I liked it that way. To take this design even farther... I die cut the individual blooms, stamped (with both the blooms and stem image) and attached them with dimensional adhesive. 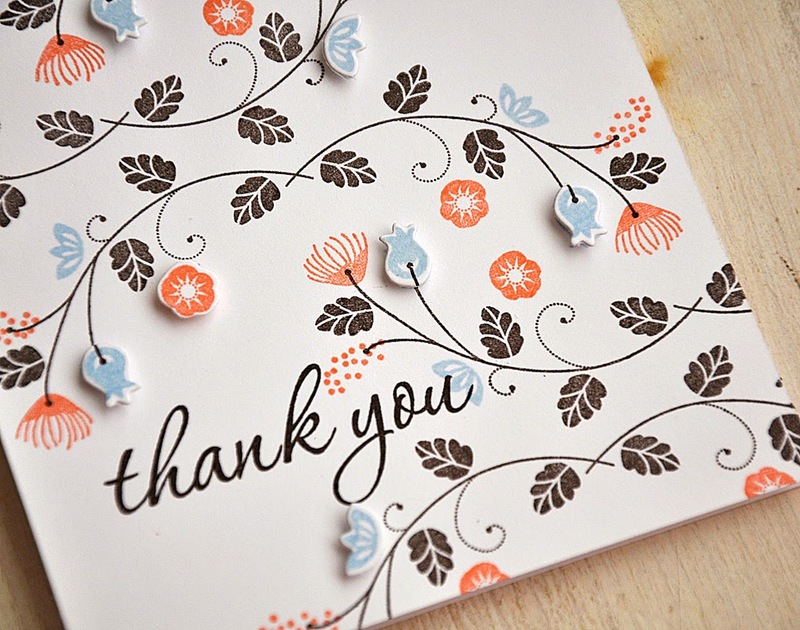 Then finished the card off with a sentiment from the Keep It Simple: Thank You stamp set (also coming out this month). Well, that concludes my look at Embellish Elegance. Just remember... this stamp set will be available for purchase through Papertrey Ink, beginning March 15th. I love that you used brown in this set! Both cards are just beautiful! Gorgeous creations!! So glad you are back! Very pretty cards! I love the vines on the second one especially. So happy to see you back, Maile! 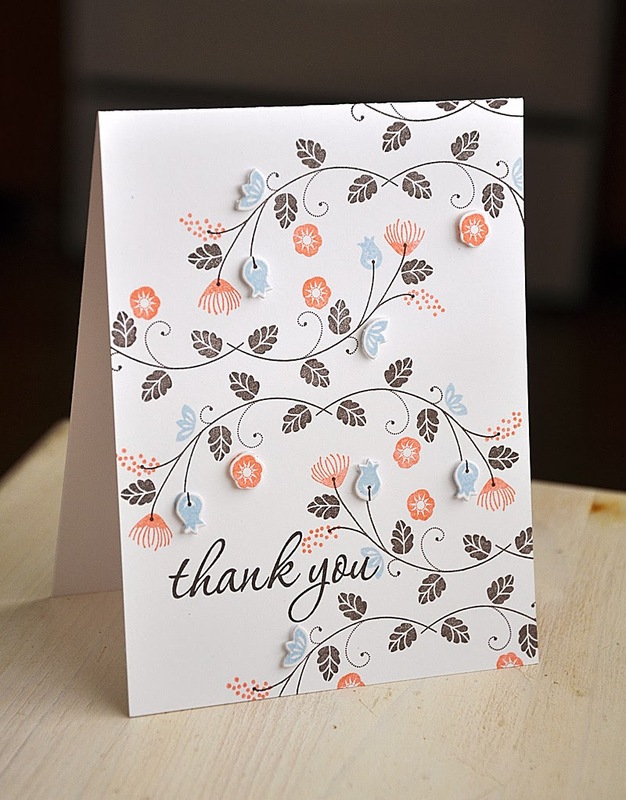 Your cards are drop dead gorgeous and so inspiring. Just love these cards. The colors are so stunning. So fun to have your back. These are just beautiful. Love the touch of chocolate. Thanks so much. Love the cards. Your cards are beautiful. The colors you use are wonderful. Oh so pretty! The colors are so inviting! I also liked how you popped up some of the flower petals! Nice touch to an elegant card! Breathtaking, Maile! Love both cards! 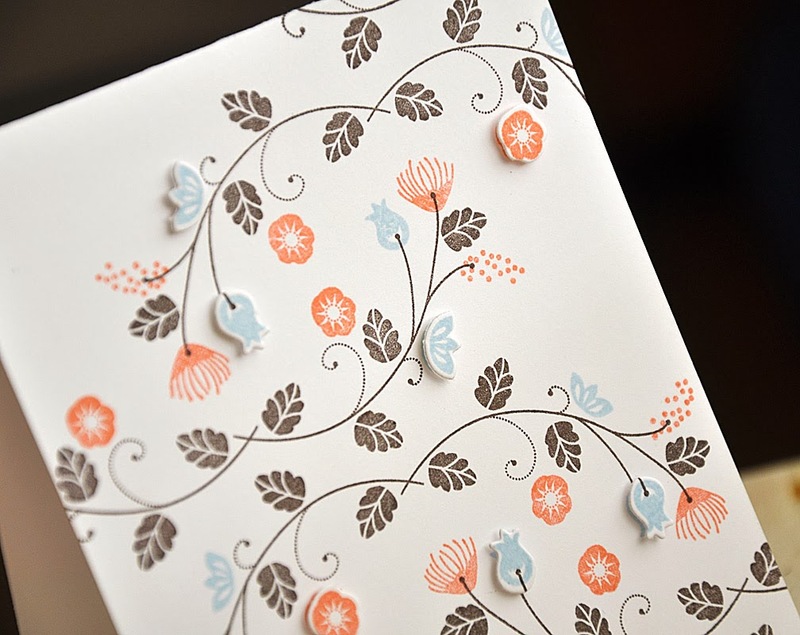 Gorgeous cards, Maile! Looks like this is going to be another must-have set! Both of these are beautiful, Maile! So glad you are back!!! Both of these cards are beautiful, Maile! Fantastic stamping and gorgeous color choices!!! Lovely!!! So, so, SO beautiful, Maile! 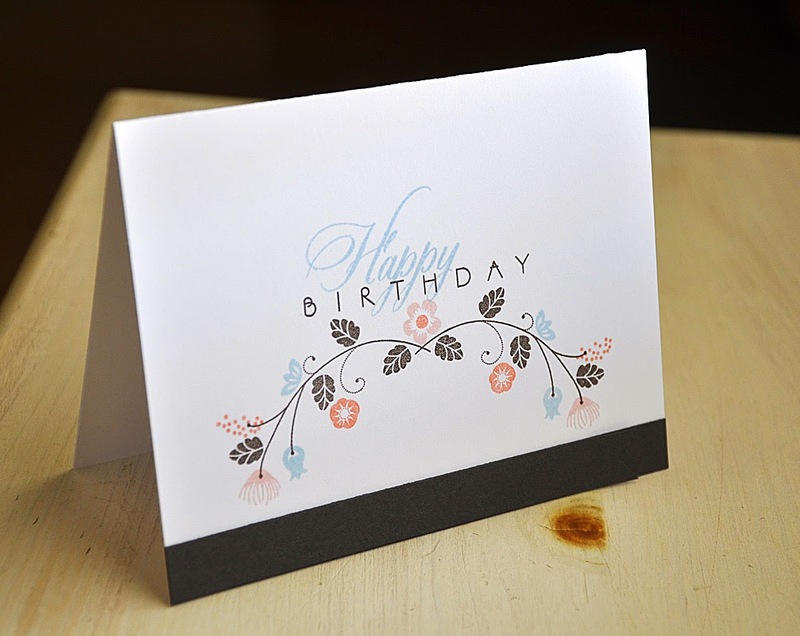 So elegant, love both cards but that addition of die cut flowers on the stamped second card just brilliant. Show cased to perfection.